What are These Bugs on My Deck? We have started a new "'Bugs Help Line" to answer specific questions from our visitors. 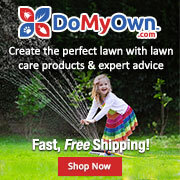 For instructions on how to submit your own questions about home and garden pests click here. We just noticed the bugs a week ago and they seem to be increasing rapidly. I've noticed that they only seem to be on certain locations all with one thing in common - some variation of man made plastic. 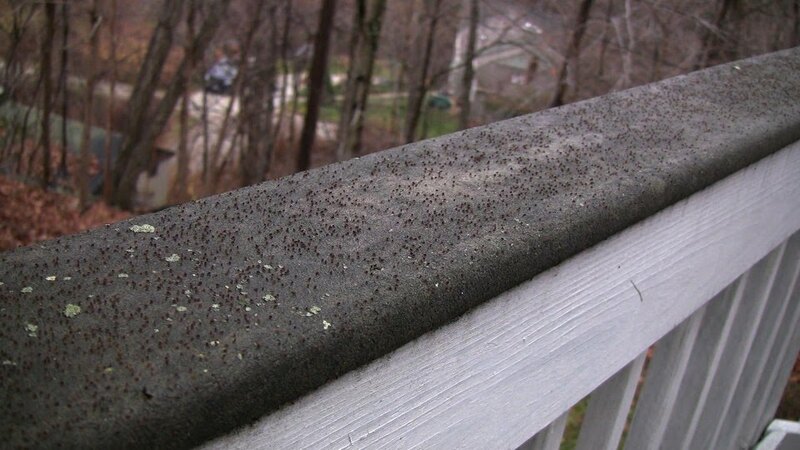 They are all over the rails of our resin deck, on the plastic slide on my daughter's play set and the vinyl sheet covering our firewood (which is far from the house). There are a few locations on our vinyl siding that has them as well. They are mostly darkish brown with a few reddish ones. They appear to have wings and hop or fly when I blow on them or touch the area around them. Do you have any idea what they are and should we do anything about them? These are called barklice, or psocids, but they are not related to true lice and are harmless. Barklice feed on the fungi that grows on surface of tree bark, or in this case on your deck. There's a related species called booklice that can be a minor nuisance/stored product pest in homes. No control is necessary and they won't damage your deck. If you clean the deck and remove the fungi/mold the barklice will go away. Various commercial cleaners can be used but ordinary laundry detergent will work as well as anything to remove fungi and mold. There are only a small number of insects that actually damage wood. Click here for a comprehensive review of wood-damaging insects in the US. We have recently started a new "Bugs Help Line" to answer specific questions from our visitors. For instructions on how to submit your own questions about home and garden pests click here. My name is Tiffani and I think I may have bed bugs but I'm not sure because I have all the bites and my 2 year old daughter who sleeps with me most nights has not been bitten once. Yet I wake up with new bites everyday. I have not yet seen a bed bug but I have not had the chance to really search yet. I want to know if it's possible that we have bed bugs if only one person who sleeps in the room is being bitten? Also thank you for your website it was very helpful. The first thing to do is to thoroughly check your bed and bed side furniture for bed bugs and/or dropping. Left up the mattress and check any folds or seams for reddish-brown bugs or their black, greasy droppings. Also check nearby tables, the bed frame, and so forth. Here's a drawing of what bed bug bites and bed bug hiding places look like. If your search fails to turn up evidence of bed bugs then the bites are probably caused by something else. I think it is unlikely that you alone would be bitten and not your daughter sleeping in the same bed but nothing is impossible **. ** A commenter has pointed out that not everyone reacts in the same way to the allergen in bed bug bites. Just as people differ in how they react to mosquito bites (medically very similar), some people get a large, itchy swelling while others hardly react at all. So, the absence of a "bite mark" does not always guarantee that no bite has occurred. If bed bugs are not the cause take a look at this list of other possible causes of mysterious bug bites. If you do find bed bugs use the cleaning suggestions in the page cited above to get rid of them. Usually a thorough cleaning and a light dusting of insecticidal dust of the hiding places is enough. Which are the Best "Bug Sprays"? Whenever I'm ask to recommend a good "bug spray" (aerosol spray insecticide) for general pest control in homes I'm tempted to answer "none" because, in fact, aerosol spray cans are not a particularly good way to package and apply insecticides. The reasons are pretty simple: aerosol sprays cans are expensive to manufacture thus making the cost to the user very high compared to other forms of insecticide; also, because aerosol cans are under relatively high pressure they produce a very fine spray droplet which tends to drift in the air making it difficult to place the insecticide exactly where you want it (and where you don't want it, like up your nose! ); and finally, for those concerned about waste, you're left with an empty metal can that has to be discarded. Having said all that, however, I know that many people prefer aerosol sprays to other forms of insecticide packaging because they are very convenient, and cost is usually a secondary issue. So, if you are going to use aerosol sprays, which are the best for use in homes? Fortunately, within the last few years new aerosol insecticide products have been developed that are much safer for the user and less damaging to the environment ("eco-friendly") in terms of their effects on other, so called non-target animals. These new aerosols contain natural plant oils instead of synthetic pesticides and for this reason are sometimes called botanical insecticides. Do Plant Oils Work As Well? Perhaps surprisingly the answer is yes. In the right formulations plant oils are just as effective as the synthetic pesticides found in older bug sprays. And, another big advantage of botanical sprays is they usually smell better, with what can be described as a soft botanical scent. Older aerosol insecticides often have a strong petroleum solvent odor. Pesticides based on plant oils are now available in a variety of formulations including wettable powders, dusts, liquid concentrates as well as aerosol sprays. Only the aerosols are generally available in retail stores and even these can be very difficult to find locally.However, a wide variety of natural and organic insecticides (most based on natural plant oils) are now available online here. Until fairly recently homes were protected from most termites by treating the soil around the home's foundation with highly toxic and long-lasting insecticides such as chlordane. Even today soil-applied insecticides are still used but the insecticides now are less toxic and less persistent, and may be less effective. Baits designed specifically for termites are now more widely used. Termite baits combine a low toxicity insecticide with an attractive (to termites!) food, usually some kind of cellulose. Bait stations, usually a plastic tube containing a bait that can be buried below the soil surface, are placed around the property where foraging termites find them and carry poisoned food back to the termite colony. Control is maintained over time with periodic replacement of the bait. Termite baits are much less toxic and environmentally hazardous than old-style, soil applied insecticides. They are very effective when used properly and maintained over time. The main disadvantage, however, is they do require regular, long-term maintenance and for this reason can be expensive compared to a one time insecticide application. There are several termite bait products available to homeowners as DIY projects however most are only available through pest control companies. For much more information about termite baits, including current products, see the following article: Baits for Subterranean Termites. I've also posted a series of articles about termites in general starting here including pictures of the different termite castes. We have launched a series of articles at our 'Bugs site to encourage homeowners to do their own pest control rather than relying on professional exterminator/pest control services. We believe that in many, perhaps most situations homeowners themselves can manage pests more economically and with less environmental impact. New articles are arranged geographically so that we can focus on just the most important pests where you live. Our second article focuses on the south-central US in and around the cities of Dallas, Houston, Oklahoma City, Tulsa, and Pine Bluff. Which Pesticides Kill Bed Bugs? Because bed bugs are so closely associated with bedrooms and bedding we need to be especially careful when selecting a pesticide to use against these little blood suckers. It makes no sense to apply a toxic pesticide in our rooms and on our beds that we would then be exposed to as we sleep or otherwise use the room. Fortunately there are now very effective natural dust insecticides for use against bed bugs that also offer a wide safety margin when used in bedrooms and on bedding. These natural dusts include silica, pyrethrum and botanical oil combinations. These dusts should only be used after all exposed bed bugs are removed by thorough vacuuming and cleaning as a final step in your bed bug control program. We've posted a series of articles at our 'Bugs site about bed bugs, bed bug control and using natural dust insecticides. The first article is about bed bug indentification and life cycles and you can follow the links to the other articles about control and which insecticides are available for use indoors. Where Do Fleas Lay Eggs? Fleas are probably the most common and vexing pest problem for most pet owners. These tiny ectoparasites bite to feed on blood from our pets but will bite us as well. Flea bites result in itchy lesions, secondary infections and even the transmission of internal parasites and diseases. Homes can be quickly infested, seemingly over night, and once this happens getting rid of a flea problem can be all-consuming. While modern flea medications like Frontline (tm) do a excellent job of controlling biting fleas that are on pets, what about flea eggs? Where do fleas lay their eggs and how can these eggs be killed at the same time as the adult, biting fleas? Like most other insects fleas have several distinct stages in their development, namely eggs, larvae, and adults. For fleas in particular the only stage that bites is the adult flea. Most of a female flea's eggs are laid in the host animal's nest. In the case of indoor pets this "nest" can be anything from a specific pet bed to a favorite chair or rug to, unfortunately, our own bed depending on where the pet spends time. After a short incubation period eggs hatch into worm-like flea larvae that also live in the nest feeding on dried blood and feces from the adult. Then, after a period of development, flea larvae pupate and eventually emerge as adults ready to find their first meal of blood. Adult fleas spend most of their time in the host animal's fur feeding but occasionally return to the nest as well. Because both flea eggs and flea larvae live in the animal's nest, the nest should be treated at the same time as any treatment for the adult, biting fleas. Treatments for flea eggs and larvae usually involve a type of insecticide called an insect growth regulator, or IGR. IGRs are very safe, effective and long-lasting so they are a perfect compliment to topically-applied flea medications. We've posted a series of articles about fleas and flea control at our 'Bugs site. The first article is about flea identification and life cycle and there are links to more detailed flea control suggestions including how to use IGRs to stop larvae from developing into adult fleas. Do Dust Mites Bite Humans or Pets? Dust mites are a type of tiny mite that feeds on the organic debris, or dust, in our homes. What we call "dust" is actually made of a mixture of hair, skin cells, plant pollen and other stuff that we and our pets shed every day, plus material that blows in from the outside. On a percentage basis skin flakes and dander from animals make up a large proportion of dust in the average household. Dust mites feed on this debris and usually go about their business pretty much unnoticed. Dust mites are light in color and tend to stay in undisturbed areas where dust accumulates. Dust mite do not bite people or our pets and in fact don't have the type of mouthparts (jaws) that would allow them to bite even if they "wanted" too, nor do they burrow into skin in the way that scabies mites do. The main problem that dust mites cause is allergy. Dust mites are notorious for the allergens, substances that cause everything from a stuffy nose to full-blown asthma, that they excrete in their feces. For more information about dust mites, dust mite allergies and protecting yourself from the allergens we've posted a series of articles at our 'Bugs site. The series start with "House Dust Mites and Dust Mite Allergens". Bed bugs (sometimes spelled bedbugs, without the space) are fairly small (1/8"-1/4"), wingless, reddish-brown insects that are only found in association with people, usually in the room where people sleep. You never find a bed bug just crawling around outside, for example! They don't move very fast, can't fly and depend on us to move them from place to place usually by hiding in our belongings. Bed bugs are normally first detected because of mosquito-like bites that occur during the night. Bites itch but are not otherwise dangerous because bed bugs do not spread disease like some other insects. Once bites occur an inspection of the room and bedding will usually turn up the insects between the mattresses, on mattress seams or on bedside furniture. See pictures of bed bugs and a drawing of hiding places and bites. The second link also has information about safe and effective ways of getting rid of bed bugs if they do turn up. Subject: What Do Bed Bugs Look Like?